Quetzalcoatl: The legendary plumed snake leads the Cacao force and his power allows him to use Cacao to summon Flower Gods while maintaining offensive presence with his legendary Feather Burst attack. Hi Everyone! This is Genaro Vallejo, from Macua Studios and here is my quick re-cap of my experience in Sheffield Doc-Fest, United Kingdom. As my first time in Europe it was such an honor to show our team hard work internationally! After landing in Manchester in whole new continent for me to move around, somehow I found a way to arrive to Sheffield, the landscapes during my train trip to Sheffield were simply stunning. Once I arrived to Sheffield, I was surprised how kind and polite the Sheffield staff were, The helped me booking my hotel and installing the Borders Cabinet at the Millennium Gallery. It was such a breeze with their assistance!. The next day the Alternate Realities showcase (The place where Borders was shown during the festival) officially begun and I was really excited! I meet a lot of amazing, interesting and awesome people at the event and they loved the game! 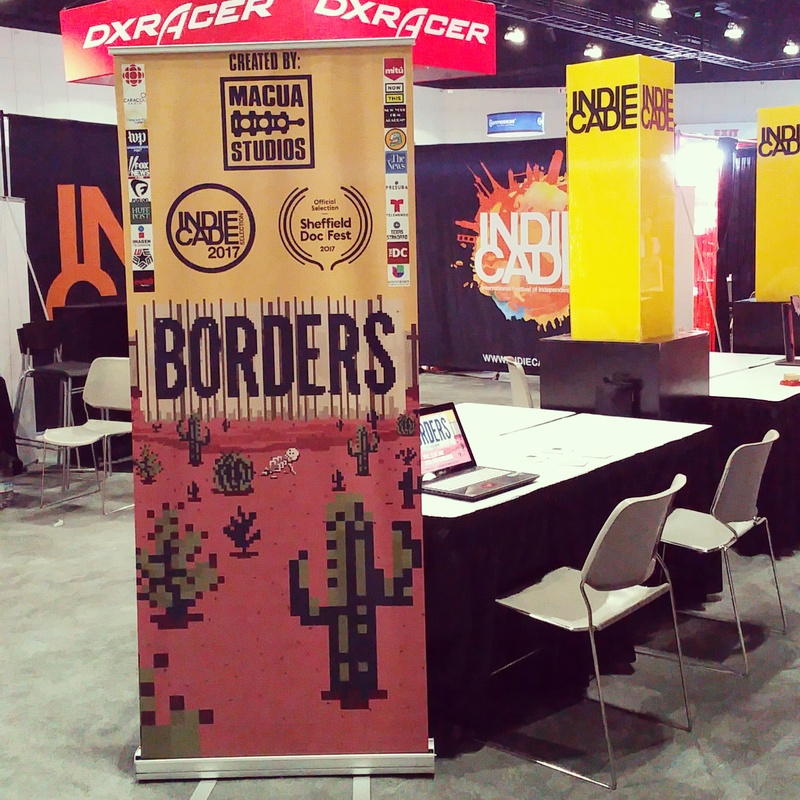 Being a more interactive experience in a Documentary-centered document, Borders stood out as an important and innovate art piece that shows that video games also can be used as a powerful tool for story telling. On Sunday Jun 10th, I had a public panel on It’s a Family Affair: Small Stories, Big Meaning. in which we discussed how our small stories about immigration and family can have a impact in others. It was an unforgettable experience sharing the panel with really talented people that use new forms of interactive media (VR and Alternate) to tell stories in a whole new level. After an intense but life-changing 6-day experience and a cancelled flight. I got a quick break spending an unexpected night in Manchester’s outskirts, which helped me to recover after a long week. I am really happy and grateful of both Gonzalo and Jon, because thanks to their hard work and motivation we can show our projects, not only in video game events but also in Documentary-Film as well, is a testament that video games is such a powerful art form that can transcend media.